I went to my first Dominaria Prerelease and I has a blast. There were opening day drafts at my LGS (Local Game Store) Forgotten Path Games It was only $10 to draft! I also won 2 more packs. I received three packs as usual for less than MSRP. I’m really blessed that such a cool store exists within a 5-minute walk from my house. The owners are awesome and they have fair prices, check them out if you are in the NorCal Bay Area. Click Images on this article to see full images on imgur. I managed to draft a pretty epic Izzit Wizard Blue/Red Aggro/Tempo deck. I went nuts grabbing cheap cost cards while I passively rare drafted for some pretty pricey rares. Here is the deck I managed to put together. The average cost of my cards to cast was 1-2. I almost didn’t have enough creatures and had to throw in some real basic 2/2s. The meat-and-potatoes of this deck was the wizards. I somehow managed to get two of the Izzit Signal Post Legendaries. This is what forced me into the archetype. The synergy between these cards was nuts. Although I was dumb in one match where I accidentally cast the 2nd legendary and had to destroy one… don’t make my mistake. Fortunately, I was so far ahead it didn’t matter. The synergy with all the instants I pulled helped win most matches. I didn’t get as much removal as I would have liked, but this was enough. I even wiped on my opponent’s side when he had three saprolings once! I wish I had grabbed at least one Wizards Lightning or a Wizards Retort. Although those are uncommon. Here are the tricks and fixing I had. I won a couple battles between creatures by throwing an opt, which pumps all wizards if Adeliz is out. I won one game with Run Amok with just 1 extra damage getting through with trample. Here were my auras and equipment. Turn 1 creature, turn 2 frenzied rage is brutal. Arcane flight is so cheap, and makes every fly. I saw someone throw an Arcane Flight on the 9/3 black creature in the set and win a game alone (10 damage in the air is rough). I will contest if you get Blackblade to equip to something that is game over. I only did it once and my opponent instantly quit. Here are the foils I grabbed and the promo I got for showing up. I think I’m going to make a Black/White Brawl deck so this foil Arvad is going straight in that deck, maybe even as commander. Brawl is a new format where people can play commander with standard cards and only a 60 card deck. Here were the rares I pulled. 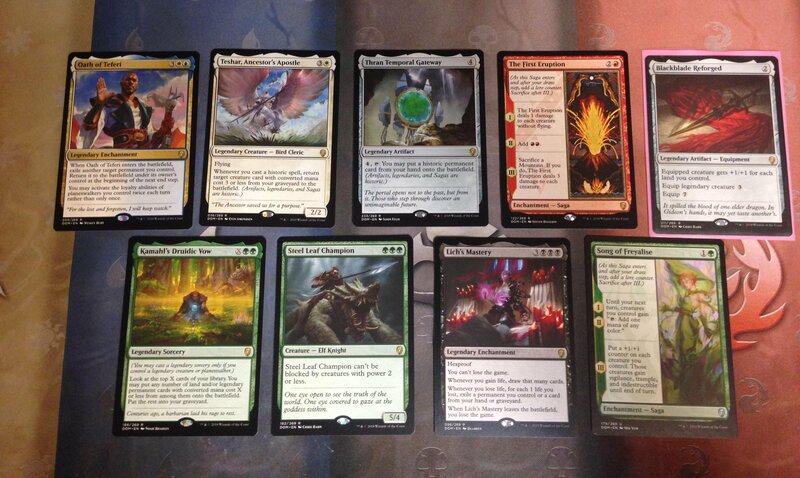 I rare drafted just a bit… I grabbed almost every rare that came my way. I wish I had grabbed a few more foils, but I needed to control myself and make a deck. Here are the prices for these cards as I type it: Oath of Teferi($1.27) Kamahl’s Druidic Vow($1.07) Steel Leaf Champion ($5.48!) Lich’s Mastery ($2.68) Thran Temporal Gateway ($3.51) Teshar, Ancestor’s Apostle ($3.75!) Blackblade Reforged ($1.25). If you rare draft, there is money to be made. I paid. $10 for about $20 worth of rares and two more packs. I will post videos when I open the prize packs in the near future. I have been teaching myself Markdown styling, so I hope this new format for articles is a little more visually appealing.